Midsize learning technology company sought to move all files to the cloud for disaster-recovery reasons and to boost employee productivity. 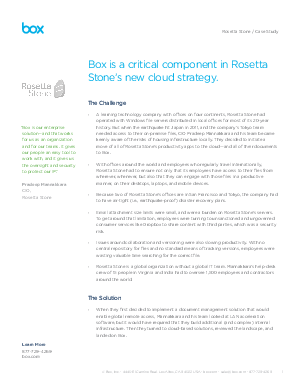 Added Box to their existing cloud stack for all employees. Streamlined IT operations; in the process of replacing servers with Box. Technology industry, midsize company, midmarket, global, server replacement, cloud stack, NA, APAC.